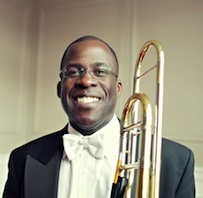 Kenneth Thompkins was appointed Principal Trombone of the Detroit Symphony Orchestra by Neeme Järvi in 1997. Prior to this appointment, he held positions in the Buffalo Philharmonic and the Florida Orchestra and performed with the New World Symphony under the direction of Michael Tilson Thomas. A former participant in the Detroit Symphony’s African American Fellowship Program, he has been a mentor to several Orchestra Fellows over the years. Kenneth has been invited to perform and conduct master classes at many music schools, including the Curtis Institute of Music, Mannes College, the University of Michigan, and Interlochen Arts Academy. An active chamber musician, Kenneth performs frequently in recital and is a member of Detroit Chamber Winds & Strings. He has performed concertos with both the Detroit Symphony Orchestra and New World Symphony. Kenneth has toured Europe with the Los Angeles Philharmonic, and has also performed with the Toronto Symphony Orchestra, San Francisco Symphony, New York Philharmonic, and the Chicago Symphony Orchestra. He can be heard on recordings by Detroit Chamber Winds, the Los Angeles Philharmonic, and the Detroit Symphony Orchestra. Recently, he contributed a chapter to The Brass Player's Cookbook: Creative Recipes for a Successful Performance. Kenneth received his bachelor’s degree from Northwestern University, where he studied with the late Frank Crisafulli of the Chicago Symphony, and a Master of Music degree from Temple University, where he studied with Eric Carlson of the Philadelphia Orchestra.